Hearty and soul-warming paleo chili, loaded with extra veggies and familiar flavors. 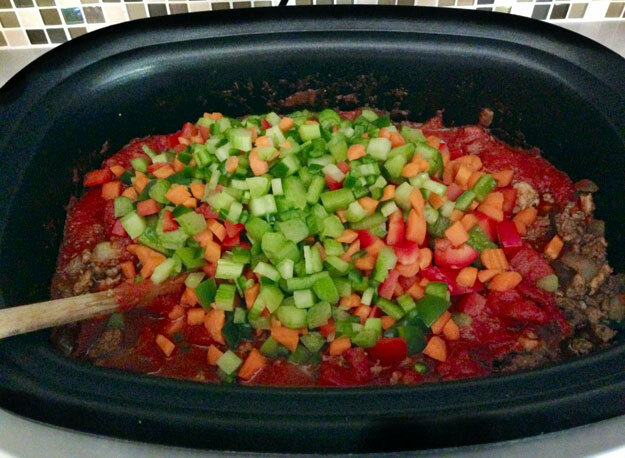 And here’s the best part…your slow-cooker does most of the work for you on autopilot! [Updated Post – August 2015] Since I first posted this simple little paleo slow-cooker recipe nearly 2 years ago, I’ve been truly humbled by the many wonderful comments and emails I’ve received from paleo peeps. You all are the best, and I just wanted to shout out a big “thank you!” to everyone. Your kind words make my crazy obsession with whipping up the best paleo recipes I possibly can for you here in my hot little Arizona kitchen all worthwhile. And, so much fun! I created this recipe when I was still pretty much a paleo newb myself. I was craving a steaming bowl of hearty beef chili at the time…but now that beans and cheese were off the menu, I had to get really creative for the paleo version. That’s why all the veggies in this recipe. They really do help make up for the traditional stuff that got the big paleo heave-ho. Nothing better than healthy, slow-cooked veggies to make it hearty and satisfying. No beans in this ground beef paleo chili, but lots of veggies! Slow cook in crockpot for about 6 hours. Top with crumbled bacon and diced avocado. Serve hot! Now before you start to think this recipe must be a vegetarian’s dream, let me set the record straight: there’s some serious meat in this chili! A good 2 pounds is going in the pot (ground beef or turkey – your choice) nicely browned with sautéed garlic and onions. And what really earns this paleo dish the right to be called a chili is this: the special combination of herbs and spices. There are a lot. But all are very common ingredients you probably have in your spice rack right now. Now, let’s talk about your taste buds for second. In particular, your palate’s sensitivity to spicy ingredients…as in jalapeños and cayenne. If you know you don’t like moderately spicy food, I suggest you omit the cayenne and jalapeño, and consider backing off on the chili powder a little too – go with 2 tablespoons instead of 3. On the other hand, if you were born with an asbestos tongue, then by all means crank up the heat – add yet another spicy pepper of your choice and/or sprinkle in extra cayenne. Follow these basic guidelines and you’ll get your first batch pretty close to perfect. Then the next time you make it, you’ll nail it for sure. Alright, enough chit-chat. You’re ready to make some awesome chili! I’d like to make this today, (Monday) and freeze for an event on Friday. Do you think that would be okay? Or should I just do my meat, garlic and onions today and freeze that and make the rest fresh? Please advise. I’m excited to try this recipe for my daughter who has begun paleo for health reasons. This a freezer friendly meal so cook it up and freeze away. It’s one of the reasons I love it so much. Let me know what you think! :) Enjoy! I’m making this for the first time for a visiting friend who is on a low carbs diet. My house smells amazing right now! I just gave it a quick stir a few hours in (because I’m impatient) and tasted the ladle…oh my gosh it tasted so good! I hope our guest loves it as much as I know we will! P.S. I hate cumin, and I hesitated using the exact amount, but I ended up adding a tad more, I don’t know myself anymore! And I’m one of those who love spice, so I might have added a sprinkle more of the hot stuff. Thank you so so much for this recipe! Hi Misty, I laughed out loud when I read your comment! (I’m sorry for the delayed response) Thank you for giving the cumin a go in the recipe. I’m kind of a spice snob and really feel it adds a smokiness you wouldn’t get with out it. I’m so excited you enjoyed and thank you so much for taking the time to let me know. Your comment made my day! If I am low on time, can I cook the Chili on the slow cookers High setting for 3-4 hours? Hi Chris, Yes! Cook until the veggies are tender. It’s the carrots that take the longest, so just make sure you chop them small. I have made this probably 30 times. It is my favorite thing!! I have also shared it with at least 10 friends. I add mushrooms and zucchini. LOVE!! Do you have the nutrition info on this? I stay under 20 carbs a day. Sorry Cassy, not at this time. 290 cal; 12 g fat; 13 g carbs, 4 g fiber (9 g net carbs); 33 g protein. Rheanne, did you save the recipe in MFP to share to their database of entries? If so, what did you title the recipe? I’m trying to find it to add to my Food Log. Trina, OMG, this is some spectacular chili!! You can plug the individual ingredients into My Fitness Pal and it will give you the full nutritional breakdown. I love this recipe, I’ve made it many times and my husband and friends love it. I’m not paleo, but I really like chili and don’t want to put beans in it, so this does the trick! I usually serve it with corn bread and a few other toppings (sour cream, cheese, green onions) so people can customize to their liking. Making a big batch for the Superbowl tomorrow, can’t wait to eat it! Thank you Christine! I really appreciate you taking the time to let me know. I try to make delicious meals, that just happen to be paleo. :) So I’m happy to know it has become a favorite in your house! I used it over chili fries the other day and it was so yummy! I hope you find more recipes here to enjoy. This was absolutely delicious! Only adjustments I made were that I left out the jalapeño (my hubby doesn’t like pieces of them in his food) and cut the cayenne pepper down to 1/8 tsp (I’m a wimp). It turned out so good! I will definitely be making this again! Sounds perfect Kerry! I’m happy you and your hubby enjoyed! :) Thanks for taking time to comment. Complete paleo and cooking newbie question here, but when you say “yields 8-10 servings” roughly how much is a serving when tracking calories? Thanks. THANK YOU! This was ridiculously easy and delicious. I used my electronic pressure cooker and in 10 minutes I was in chili heaven. It had the kind of slow heat that you can feel without burning your mouth. My two nephews ate it up and had their veggies without even knowing it. This is going to be a great winter comfort food. Hi Misha- What setting/how long did you pressure cook for? This is an excellent chili recipe that is hearty and tasty and my whole family loves it. I use half a jalapeno pepper without any seeds and a pinch of cayenne, so it’s not too spicy for my kids. My daughter even requested leftovers for lunch the next day. If I want to add sweet potatoes, do I add them raw, or do I cook them first? I am going to try this recipe, and am a newbie when it comes to cooking. Thanks! Oh my goodness, this was by far the best chili I have ever had!!! I didn’t use basil (just because I didn’t have it) and I added cubed sweet potatoes with 2 hours left. The carrot and celery added such a fresh flavor and I loved the colors! And the bacon and guacamole is brilliant! This chili has so much flavor and my husband LOVED it! Thank you so much for this recipe! Hi Jenny! Awesome! I’m so glad the chili was a hit at your house! Always a winner when the hubby approves :) I hope you find more here recipes to try out and enjoy. This amazing chili just won first place at a church chili cook-off whoop whoop!!! It’s so amazing! I added an additional tablespoon or teaspoon to the spices and it’s perfect for my liking. This recipe is a keeper! I really do enjoy this recipe. I consider the meat, tomato products, and spices as a ‘chili base’, then I load it up with veggies. My go to is cauliflower, cabbage, and hot peppers. I know I can count on this turning out great and nice and easy in the crockpot. I love this recipe! I sometimes add finely diced mushrooms as well and also so that I don’t miss any “crunch” from the crackers some people put in or the “carbs” of a side of cornbread, I sprinkle on homemade toasted pumpkin seeds! I have this cooking right now. Smells so good. My absolute favorite chili recipe!!! And my young kids love it. I use a little less cayenne and double cumin, and run the carrots and bell pepper through the food processor, so my kids don’t notice them. The best chili. Theresa you are genius! Never thought of that. Anything to get the kids to eat more veggies. :) Glad you enjoy! The sweet potato replacing the carrots sound awesome. I will have to try both ways since I like both. Can’t wait to try this! I’m a non paleo aussie and i stumbled across this recipe due to the myfitnesspal app. Now this is my go-to chilli recipe! Love the spices. Sorry, I am not tracking carbs at this time. Yay! :) Thank you for letting me know! Just took some out of the freezer for a quick dinner tomorrow! Can’t wait! Hello! I made this last week and loooved it! I was hoping to make this for a cabin trip this weekend. Can I prep and freeze this beforehand and then cook it later (maybe freeze Thursday and cook on Saturday night for Sunday morning)? Thank you! This was delicious chili! The only changes I made are I left out the jalapeno (didn’t have one) and used half each of a red, green and yellow pepper. I also cooked it covered, on low, on the stove top, for about 5 hours instead of in the crockpot. I’m of the opinion that chili is one of those things that the longer it cooks, the better it is. Oh, and I forgot to cook the bacon, didn’t have avocado, so I used shredded cheddar and sour cream. Delicious!! Made this today and it is delicious! Used 1.3 lbs of turkey and .5 lbs of beef. I ate it over zucchini noodles, but it would be even more amazing over sweet potato. I’m looking forward to the awesome leftovers! I will say that knowing my husband doesn’t like spice, I left out the jalapeno as well as the cayenne. It was delicious! I used sweet potatoes instead of carrots and it was so good that I’m making it again and doubling up the sweet potato. I made this chili last night and it turned out excellent. Thank you very much for the great recipe! I was wondering if you have tried using fresh tomatoes instead of the cans, and if you had any direction on how I should go about eliminating the cans next time. I’m so happy you enjoyed the recipe! You can find jarred tomatoes at Whole food or online at Amazon. Also, I encourage you to use fresh if you have the time. You can blanch, peel and dice the tomatoes and you’re good to go. I used can because I want people to be able to use ingredients they have on hand. Hi! My workday is about 8-9 hours but I realllllly want to make this in the crockpot tomorrow. Any suggestions on what I could do differently to be able to cook it longer? Maybe not pre-cooking the veggies? Hi there…well you could let it cook overnight tonight and put it in the fridge before you head off to work in the morning, then reheat when you get home from work. Another option would be to just set your slow-cooker on the lowest setting possible before you leave for work, and it should really still turn out just fine even though your 8-9 hour work day is a few hours longer than it actually takes to cook. Hope one of those options works for you! Made this last night, it looked so delicious in the crockpot! Followed the recipe to a T….but for us, WAY TOO HOT! Not sure if we are just wimpy up here in the North or if I did something wrong but it just was inedible. So sad, The comments about grandchildren eating it and people doubling the spices have me amazed. This was delicious! Instead of ground beef, I put 2lbs of boneless skinless chicken breast in the crockpot before I added the sauces. After 8hours on low, all I had to do was stir, and the chicken shredded perfectly, so yummy! Maybe I totally missed this – but how many servings does this yield? Would it be enough for 5 people? I just need to say….this is the best chili I’ve ever had. I make this recipe a few times a month! So so so satisfying and flavorful!! Would I be able to make this on a stove top? Hi Trina, I’m a bit confused. I am new to Paleo and I want to try this recipe but I’m a bit confused. I thought we couldn’t use any canned ingredients on Paleo? Please correct me if I’m wrong. I have just found my go-to chili recipe :) I wondered how chili without beans would taste, and now I no longer have to wonder. Everything about this chili is amazing…the spices, the balance of meat and veggies….so flavorful! Thank you so much for posting! Added sweet potatoes and this was perfect, thanks for this recipe. Arizona native saying Gracias from Oregon! So excited to try this recipe. Do you happen to have the nutritional value? Or the number of servings it makes to enter into My Fitness Pal? Thanks so much for any available help! I was just going to leave a comment too. I am having my leftovers over a sweet potato and it is simply delicious. The recipe looks fantastic and I bet it taste delicious. I will definitely try it tonight anyway. I just wanted to say I have made this chili recipe seven or eight times now and simply love it! My parents came down for a visit and I made it for them (my dad has bad reaction to beans) and they loved it so much they asked for the recipe (a rarity!) I’ve been doing Paleo living for about six months now due to some severe anxiety and panic issues that ended up having a lot more to do with inflammation of my stomach lining than I ever knew and your website is seriously one of my top three go-to websites when I’m meal planning. I trust your site over most others for sauces, entrees, tortillas, etc. What you are doing is absolutely helpful to the healing of my body and delicious for both me and my sweet husband who eats paleo most of the time now. :) Thank you so much for everything you don’t even realize you are doing in one young woman’s life! First time making this chili and I will definitely be making it again. It is great! Tastes as great as it smells! I decided to do half a jalapeño and I’m glad because I’m not a huge spicy food eater. But the kick the half gave it was perfect for me. I think I’ll try it with ground turkey next time–thanks for the fantastic recipe! I am so glad I found your website! I have been cutting processed foods, carbs and sugar lately and I often find myself running out of low carb dinner ideas. Thanks for sharing! I will be making this chili for dinner tonight! Best chili ever!! I’m on a low-sodium diet, so I eliminated the salt. I also eliminated the bacon & avocado and used 1/2 lb grass fed ground beef & 1/2 lb ground turkey. It’s my new favorite dish, and my husband & daughters love it, too! Awesome recipe! I loved the chili! My crossfit gym is having a Paleo Pot Luck today so I have a pot of this brewing. I didn’t have two pounds of ground beef, but had one and a whole rabbit. Soooo, that is my edit to it. I also didn’t have cumin powder, so left it without and will give it a sample after it cooks a bit. I will have to pop by and tell you the reviews once it is over. Loved the chili, the whole family loved it!! I wanted to pin it, but I didn’t find it in the 1,000’s of recipes on your boards. Which board do you have the chili? Thanks for the great meal!! This was yummy! Will definitely make this again! Thanks! This is so fantastic and it is the recipe that helped convince my hubby that there is something to this Paleo thing. We had a go-to recipe for chili that while good, he would always “feel it” the next day. So when I decided to make this and told him it was Paleo, so no beans, he made a few under his breath comments. BUT THEN…he devoured it! He thought for sure he would again “feel it” due to the level of spice (I put in extra cayenne because I got distracted), but the next day he felt great, ate leftovers, and never felt intestinally challenged at all!! He has requested this on a couple different occasions, which is also rare! I made it as directed accept orange bell pepper instead of the green one and I didn’t have bacon on hand, so left that out. (And of course the error in spices, which turned out to still be Deeeelicious!! We are looking to get serious and try the 30 day Paleo lifestyle per Robb Wolf and I can’t wait to try lots of your recipes! Thanks!! It’s June and yes I’m making this chili recipe because my daughter is getting back from a week of camp and this is her favorite recipe ever…..
Hi have you tried this recipe doing all the prep the day before. Throwing it all in tbe crockpot and in the fridge in the crockpot and just started in the morning? But I’m stumped by the crushed/sieved tomatoes – could I just add extra diced? Oh, and yes Passata would be our tomato sauce! This chili is delicious. I’ve made it twice so far: once with ground beef and the second time with ground turkey. I preferred the ground turkey but both are good. Thanks! My boyfriend and I made this recipe and it was amazing!!! We are now making it a second time and we can’t get enough of it!! I’ve made it twice. It’s great, and it’s gotten rave reviews. I serve it with shredded cheese, guacamole instead of avocado (just because it’s hard to find avocado when I want chili), green Tabasco sauce, and sometimes pico de gallo. Tycha Brahe, thank you! I’m so glad you enjoy the recipe. Im sure your version is awesome and you deserve the rave reviews. :) thank you for your comment. Okay I’m from Texas so my flavor profiles expect more spice and heat. I upped all the spices and added 1/2 of a poblano pepper. Do like all the veggies in the chili; I never really thought of that. This recipe is exquisite! MY husband and I LOVED LOVED LOVED every bite! The recipe made quite a lot, too, but we had ZERO difficulty finishing to the last bite. Thank you! I have been making a similar dish, with more types of meats, since I went primal such as oxtail, pork shoulder, beef cubes and ground bison and any other type of fatty meat and all of the other ingredients you mentioned. And stuff it in Butternut squash, eggplant, peppers all w melted mozzarella. Or put it over roasted cauliflower w garlic n oil, or zucchini pasta or just in a bowl. A yummy taste, and I really like your style……. The tomato sauces etc to the mix?!!! I’ve given this recipe and your site to several people, they all have made and love this chili too! Today is batch number three!my kids love it ( they are 7,5,5 ) and all help make it…so wonderfully healthy. We top it with wholly guacamole since avocados can be iffy this time of year. Thanks! Super good! “tricked” my kids into thinking it was the usual Frito boat….but with lots of secret veggies. Thanks! Hi Angela! It makes me so happy when you can serve up a healthy meal to your kids and they love it. Thanks for sharing this recipe with your family. :) I’m glad they liked it! Cooking isn’t really my thing, but I’ve been trying to do the paleo thing. I went out and bought a CrockPot just to try this. Turned out good! Even my picky kid loved it. Substituted a lot of garlic powder instead of garlic since I didn’t want to go back to the store. Also added about 2x the chili powder. Great! Was just thinking.. Take away the chili powder, add a spaghetti squash, and this would be a great paleo “spaghetti” recipe. Jeff, I’m glad you braved a crockpot and you enjoyed the meal! Lots of easy paleo meals are made with the trusty pot. And you’re right, it’s easily adapted to spaghetti squash and we have even served this over a baked sweet potato as well! Great comfort food! :) thanks for commenting! This was fantastic! Especially the next day. This made a TON of chili, and I had to add 2-3 X’s the amount of Chili powder. I also used half beef/ half ground turkey. Don’t be afraid to boost up the spices to get it to your liking. Thanks! Thank you so much for sharing this recipe. I made it overnight and it came out perfect! So good! I’ve added this recipe and a link to it at my website! Thanks so much for sharing! Just browned the meat and put everything in the crockpot! Smells delicious and it looks like it will be great. One question….Is cooking it for 6hr a must? I was wondering if you have tried it by cooking it for 5hrs? Debbie, if your meat is browned you probably do it in just a few hours. Just make sure the carrots and veggies are tender. I’m sure it will be great! I just spooned out a bowl and it rocks!!! I used turkey meat and it is ahhhmazing. I onlycooked it high for 4 hours and it is fine, but I’m sure it will taste even better tomorrow when the flavors marry. 1st paleo meal in crockpot. 1 1/2 meat. No carrots or celery. 2 jalapeño. I think that would only make it better….next time!! Thanks Rob! I’m glad you were able to adapt it to your taste. It’s a great recipe and hopefully now you will break out the crock pot every now and then. It’s sure makes like easier. :) thanks for stopping by! Wow! This is amazing! Very good, thanks recipe. This chili is absolutely, positively, most unequivocally the BEST chili I have EVER made and I have made quite a few in my 62 years. The carrots add just enough sweetness to counteract the acid in the tomatoes. I made a couple of batches while visiting my grandchildren and froze it before I left. They called today and said it was as good as a freshly made pot and all four gallons had been eaten up. I just left them about three weeks ago! Thanks for sharing this wonderful recipe. Hi Cynthia, I cannot thank you enough for your kind review of the chili recipe. It warms my heart to know you and your family enjoyed it so much! People like you make all of it worth it! Thank you again! I made this a few weeks ago and everyone loved it! I served it over baked potatoes, and then we had tons leftover for throughout the week. I just threw everything into the crock pot and let the beef brown in there to make it even simpler. Wonderful recipe, I’m making it again tomorrow to bring to a party! Thank you!! Just made this tonight. Awesome! It’s refreshing to find recipes for good winter comfort food. My biggest fear was that I’d be eating salad and chicken breasts all the time. Thanks for the ideas. I love my crockpot! And Chili for dinner sounds delightful.. I’m going to have to plan ahead to do this on Friday! Thanks for sharing! Thank you Katriel! After you make it, let me know what you think! It’s a great recipe by itself, but you can easily spice up/down to your taste. It’s a family favorite! Thanks for your comment! Made this yesterday! Easy and yummy!! Hi Angie! I’m so glad you tried it and liked it! Puts a big smile on my face! Thank you! Hi. I want to make this tomorrow but I do not see any nutritional information. I plan to make this for a paleo potluck this weekend. How many servings would you estimate? I will probably need 2 batches. Hi Katie…paleo potluck…what a great idea! For the chili recipe, my guess is it would fill about 10 good-sized soup bowls. Hope that helps, and have fun at the potluck! Yay! I’m so glad you and your hubby enjoyed it! I hope you find that Paleo meals are full of flavor and are just as good as the foods you have enjoyed before going paleo. Here’s wishing your journey brings great health and just as important, great food! Lindsay, I hope you like it! It’s really good. And it you’re up for it, the paleo biscuits go really well with it. We just had it last week and it was yummy! :) let me know what you think! Instead of a crockpot we just cooked it in a large pot on the stove on low heat stirring every hour……It was delicious and will be our go to chili recipe from now on. Thanks for sharing!! This chili was awesome!! My husband and kids loved it and went back for seconds. Thank you for sharing it! Thanks, Trina! Turned out wonderfully! I added a few habanero peppers (we like our spicy) and substituted 2 lbs ground beef with 1 lb ground and 1 lb chuck roast pieces. This is definitely going to be one of our staples. Thanks for sharing! Sonia! That sounds awesome. I like spicy too. I held back a little to let people adjust as they see fit. It’s a great base recipe. I think I’ll make it you’re way next time! Glad you enjoyed it! I, too, am of Italian descent, but feel much better avoiding wheat and grains. I have a couple of Paleo cookbooks, but I will absolutely be following your site. Thanks for the recipes! This looks amazing! I will definitely be making this! It took three attempts to get it just right. I hope you enjoy it!